Creating an effective digital marketing presence as a small business is no longer something that is considered a luxury. Today’s consumers are entirely focused on digital information, content and purchasing, or at the very least using digital to research their next meal, product or purchase. As many small business attempt the navigate the challenging digital marketing realm, they need to know which are the most important digital marketing channels that impact their business most. According to a recent study by GetApp, a company that reviews options of social media marketing tools, small businesses are split on this question. During a research study that asked small and medium-sized businesses with respondents that were between age 25 and 54, almost 60% stated that social media impacted their digital marketing presence the most. The study also indicated that almost 29% of small business owners surveyed said that having a small business website that was optimized for mobile search and mobile viewing was the second most important digital marketing function to their small business. In distant third, just over seven and a half percent of small businesses indicated that having a mobile app for their small business delivered high impact to their digital presence. The GetApp research study only surveyed 500 small businesses regarding their digital presence and only offered answer choices that included social media marketing, mobile website, mobile app, digital signage and NFC payment options like Apple Pay, etc. We believe that leaving out important marketing channels such as content marketing, email marketing, paid media and small business search, does a significant disservice to small business that review the study. In addition, the study seems to make no reference to the importance of integrated digital marketing that incorporates multiple digital marketing channels, methods and tactics that are well known to be the most effective approaches to digital marketing today. Why Is Social Media Important To Small Business? There is no doubt that social media not only important to small business, but actually it’s crucial. When social media is combined with an effective website, consistent content creation and a proper search and paid media program, the benefits of social media marketing for a small business are clear. Here are some of the main reasons social media is important for small business. 1- Discovery – Having an effective small business social media program that incorporates multiple social media platforms that are appropriate for your brand, consistent sharing of relevant interesting content for your audience is a crucial part of being discovered by your customers. If your social media presence isn’t doing those things, isn’t growing a community and providing selfless relevant value to that audience, but is instead largely just promoting your stuff, you’re likely doing more harm than good. In order to get the discovery benefit, a small business must have enough strategic content being shared using a clearly defined strategy that includes hashtags and other methods to help their audience find them. Social media discovery offers huge benefits to grow your small business social media following when used properly. 2- Distribution – One of the most significant benefits of social media is the ability to distribute your content. Providing that you’re small business is consistently creating great content like blog posts, graphics and videos, social media enables you to distribute it and get more traffic. When social media is combined with consistent, quality content creation, your customers and fans become open to what you do. Developing your small business social media as a distribution channel for you content creates increased exposure to your followers friends and scales traffic to your site and profiles much faster. 3- Relationships – Social media can help small businesses develop more, deeper and diverse relationships with their customers, prospects and those that can expose more people to their business. There is no doubt that when a small business is utilizing social media properly that it will foster conversations with the aforementioned. Just like in the real world, when you provide value to others it facilitates the opening of communication between humans. When you use your small business social media profiles to reflect that human connection, relationships are the result. Also like offline, relationships are what produce revenue in business. People tend to buy from people they know and like. 4- Promotion – If your social media strategy and tactics include sharing interesting content, creating relevant content and building relationships through conversation on the right platforms, you earn something. You earn the right to promote your stuff to your followers and fans. This right is something that all too many small business just don’t understand or maybe lack the time to do it. If you’re expecting that the promotion of your company, it’s products or services and specials on social media will result in a huge impact to your small local company without the other key elements of providing selfless value, you are going to be sorely disappointed. 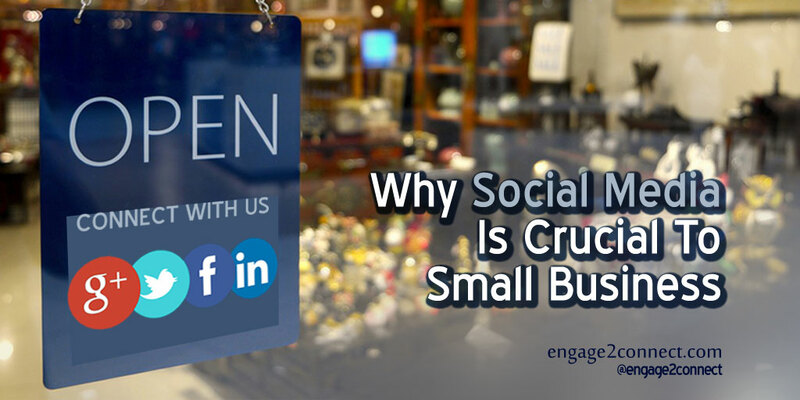 Can Social Media Marketing Alone Impact Your Small Business? Social media marketing is most definitely a crucial and important element of a small business digital marketing program. However it is important to understand that doing small business social media marketing is not effective as a stand alone component. Digital marketing at the local, regional and national level has become increasingly complicated and requires more than a single marketing component. Just five years ago, many in small business were able to be effective with just a static website or just a few social media accounts, but things have changed. Integrated digital marketing combines numerous digital presence components together to make each one even more effective. Integrated marketing at the small business level has also become something that is required in order to compete. Having an up to date website that is at a minimum of what today’s digitally savvy consumer would expect is no longer a luxury, but rather a minimum required expectation. Add to that the rise of mobile viewing and search, combined with the consumers attention span and loyalty requiring slick, professional and consistently created content, graphics and videos and you begin to realize what you are up against. Although social media is important for the small business, doing social media by itself won’t get you the returns you are likely hoping for. It has to be done correctly, on multiple platforms and every day, then it has to be combined with the other required digital marketing components that will make it work for your small business. Are you making social media effective for your business? Tell us why or why not.